Minnesota is known for its casseroles. If there were such a thing as a state dish, it would either be casseroles or hot dishes. Depending on who you ask, they are the same thing anyway. That is a debate for a different day though. I am sure some of you will weigh in:) What is the point of a casserole? Feed your family, feed them well and save some for later. That is how I grew up. You make a big ‘ole batch of something noodly and creamy and you make enough for an army, and then you get ever-loving piles of leftovers. 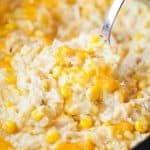 Chicken and Corn Casserole holds well, freezes well, and because it is in the casserole family…its tastes….well? They taste amazing. You get the point. For me, casseroles and crockpots keep me sane. Life gets busy and I like to slow down sometimes and enjoy my family and just take the world in. Recipes like these let that happen. Another tip that will get this dish on the table faster is to use rotisserie chicken. You can buy this at the store, OR, make a double batch of slow cooker rotisserie chicken and use the leftovers for this recipe. Using pre-cooked chicken will reduce your cooking time down by 6-7 hours! Simply shred the chicken and follow the directions the same, but reduce your cooking time to just heat through! 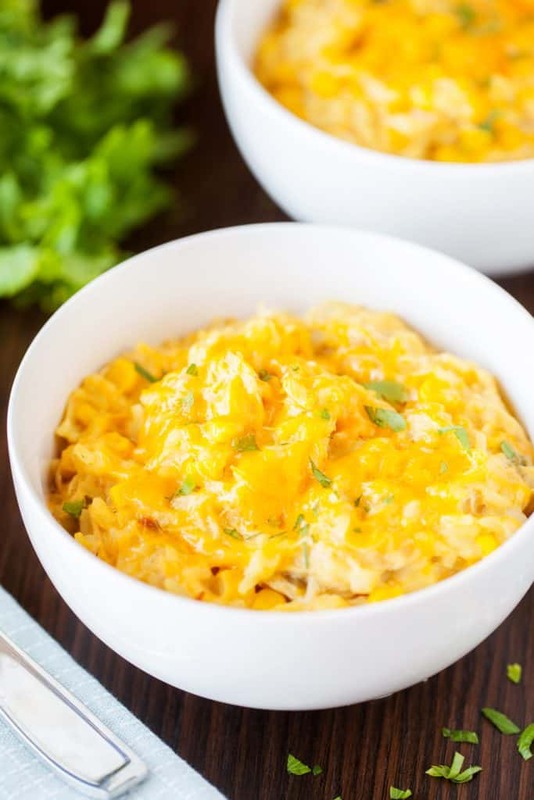 Here is a pro tip on this chicken and corn casserole recipe: The NIGHT before, place the first four ingredients in the slow cooker bowl, cover, and store in the refrigerator. The next morning, before leaving the house, place the bowl in the slow cooker and turn it on. Let the slow cooker do all the work for you while you’re away. When you return home, add the last four ingredients dinner is served! Meal prepping at its finest! I get a lot of questions about whether a certain recipe can be cooked in the oven or in a slow cooker. Most, if not all recipes that can be cooked in the slow cooker, can be cooked in the oven or on a grill or some other type of heat source. If you were to go the oven route, I would grill, fry or bake some chicken. LIghtly seasoned with salt and pepper. You could also go the rotisserie chicken route, in that case, make sure to check out my slow cooker rotisserie chicken. No matter which method you use, shred the chicken and add it to a greased baking dish. Add the other ingredients and cook in the oven at 350° for 20-30 minutes, until the cheese is bubbly. You could also layer this dish chicken, corn, cheese, ect. Just make sure the last layer is a thick layer of cheese. Looking for other slow cooker recipes? After a long day, nothing beats coming home to a warm and cheesy bowl of deliciousness. To the bowl of a slow cooker, add the chicken breasts and sprinkle on the onion. In a medium bowl, stir together the soup and stock and pour over the chicken. Cook on low for 8 hours. When ready to serve, remove the chicken and shred with two forks. Add the chicken back to the slow cooker along with the rice, cheese, and corn. Stir to combine and garnish with parsley. 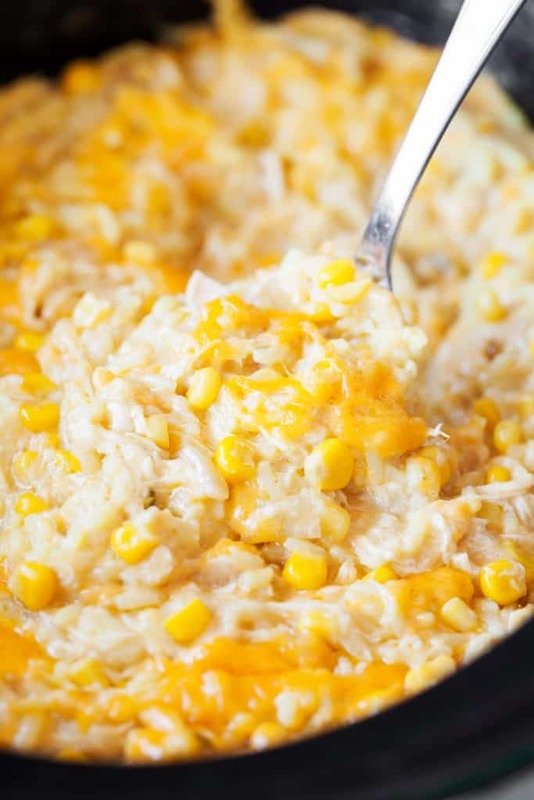 Did you Make Slow Cooker Chicken and Corn Casserole? 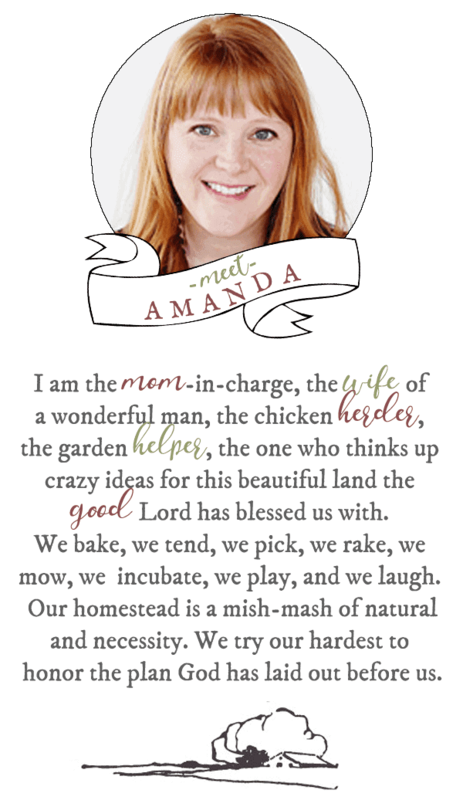 Just made this tonight and…the family loved it! Everyone had second’s. This is a winner with kids because it’s not spicy & it features their very favorite veggie-corn. Everything in this they are already familiar with, nothing new or exotic. When we walked in the door, we were greeted with the heavenly smell of this cooking in the crockpot! The only thing I might do different next time is just keep the rice in a separate pot, and spoon out some in each individual bowl. I noticed the rice got “lost” in the dish. I had extra rice so I added a scoop in my bowl, which made it more fluffy & filling. I used Basmati rice. Thanks for this simple but one of a kind recipe! Use noodles/pasta! That makes it my family’s favorite and oft requested for family get together Noodle Corn! Help! The “pro tip” says to put all ingredients in the bowl the night before and cook in the morning, but the recipe instructions read differently, and say to add the rice/corn/chz at the end…please clarify! It should read the first 4 ingredients. At the end, you add in the final ingredients and stir and serve! Sorry for the confusion! Could you cook this on high? Maybe for 4 hours? I just made this and it is good, the only this is the rice gets lost in this dish. 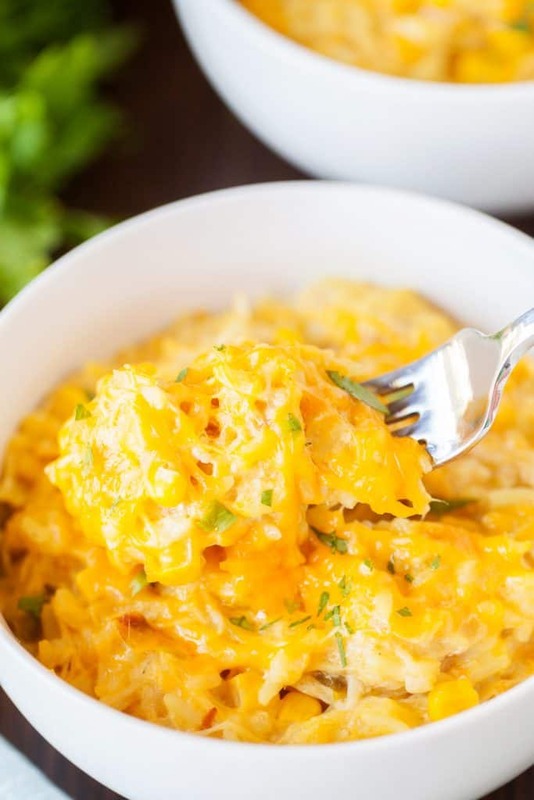 Such a delicious and easy recipe, perfect for a busy weeknight! I added twice the rice and it seemed perfect. I just made this. It’s good. Seems like it needs a little seasoning of some type. Maybe just pepper but a little too bland for me. Do I leave in or dump out the stock and soup after I shred the chicken, before I add in the cheese and rice and corn? I’m on a keto diet, can I substitute rice cauliflower for the rice? Haven’t tried this yet, but if you were to use noodles (thin spaghetti) how much would you use? Omitting the rice.